It’s Mother’s Day! Are you doing anything special? My brother and sister-in-law are having a barbecue and I’m bringing over a lasagna. When I told my mom, she said, “Yummy, haven’t had that in a long time!” I can’t wait, both because I haven’t seen my mom in a while and because I too haven’t had lasagna in a while. Lasagna is definitely something my mom would make me and my brother all the time when we were little. She’d make a big pan and we’d eat through it as after school snacks. My mom was seriously the best. But of course, she was a mom too, which meant that she sometimes made me eat things that I didn’t like eating either, like the outsides of egg tarts. We’d always order egg tarts at dim sum and I want to just eat the custardy insides and leave the outsides behind. Sometimes my mom would indulge me and eat the crusts for me (true love) but more often than not it was a you get what you get and you don’t get upset kind of deal. Now that I’m a grown up I don’t mind the outsides of egg tarts as much. Especially when they’re Portuguese egg tarts, which are decidedly different than regular Chinese egg tarts. 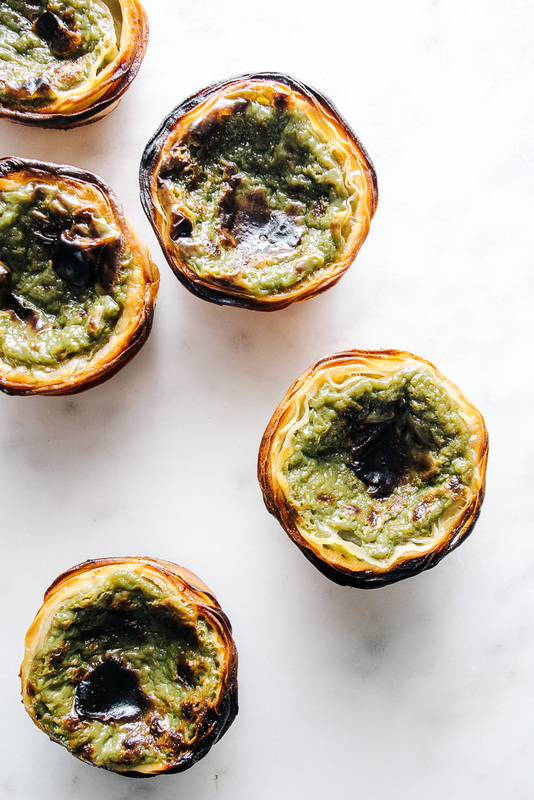 The tart part of Portuguese egg tarts is thin, layered, flaky, and when good, incredibly crisp, offering a nice foil to the soft custardy insides. 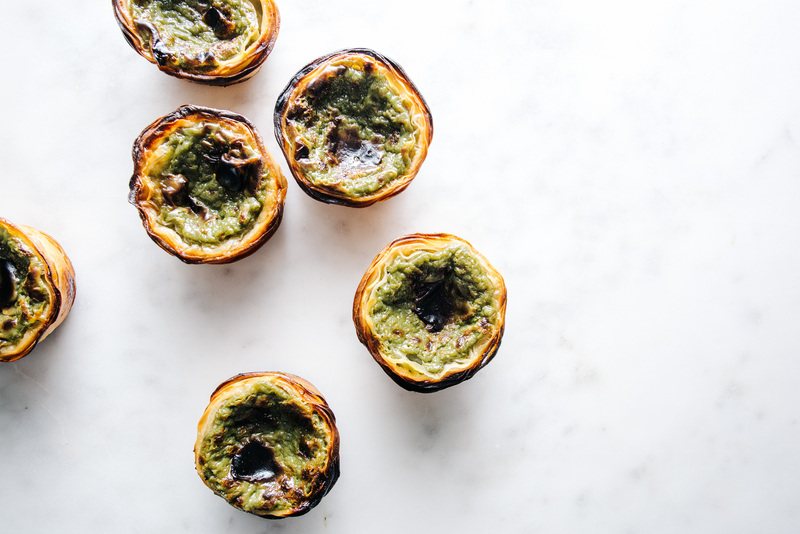 If you haven’t heard of Portuguese egg tarts before, Mandy has some insight into the whole tart-controversy. See, the thing is, there is such as thing as real Portuguese egg tarts, made in Portugal, as well as Portuguese style egg tarts which have been popularized in Hong Kong, and, as a result, other Asian communities across the world. From what I can tell, the Asian-ized Portuguese tarts are more like egg tarts, with an flan-like egg tart filling in a Portuguese shell, with some brûlée-ing on top. I haven’t had real Portuguese egg tarts, in Portugal, but I have had some in London, and the filling is completely different – it’s more thick and solid, kind of like the filling in a custard pie. Regardless of the differences in fillings, the similarity is that all of the Portuguese tarts that I’ve seen, authentic or not, have a blackened, brûléed top. Mandy, who’s site I got this technique from, has step-by-step pictures on how exactly to make this tart dough. I highly recommend you head over there! 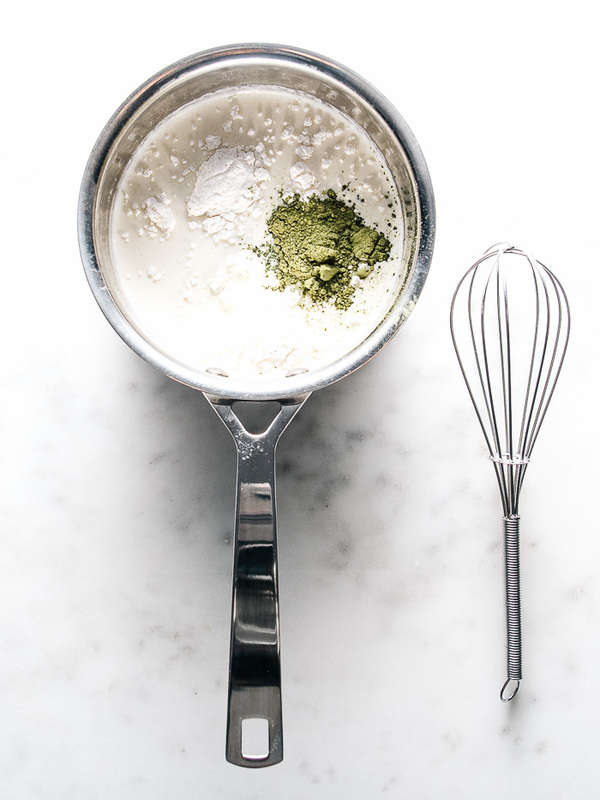 Start by making the custard: combine the milk, heavy cream, granulated sugar, flour, and matcha in a pot and set over medium-low heat. 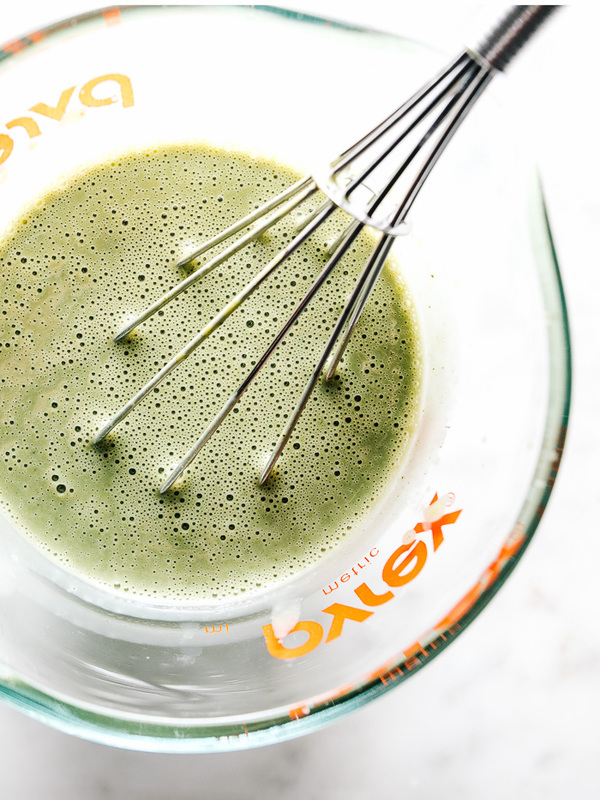 Whisk constantly and cook until the mixture starts to simmer and thickens slightly. Take the pot off the heat, and continue to whisk until lump-free, then set aside. In an glass measuring cup, whisk together the egg yolks, sweetened condensed milk and vanilla extract. SLOWLY pour the hot milk-mixture into the yolk-mixture (so you don’t scramble the yolks), whisking constantly, until evenly combined. Cover and chill in the fridge for at least 2-3 hours until cooled. It’s best if you make this the day ahead. 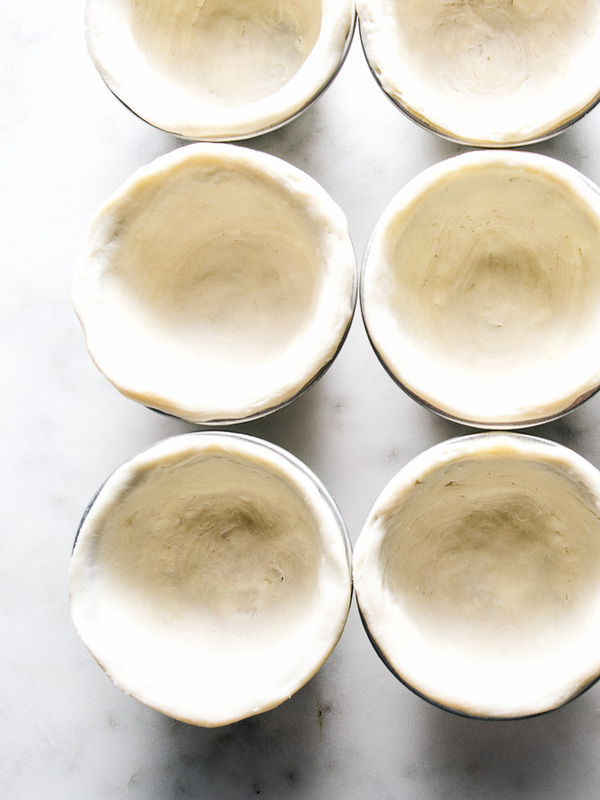 Make the tart shells: in a stand mixer, combine the flour, 1/4 tablespoon of butter, salt and water. Knead for 3-5 minutes until it forms a smooth dough. It should be soft and supple, but not sticky. If needed, wet your hands slightly and knead the extra moisture into the dough. Wrap it tightly with plastic-wrap and let rest in the fridge for 1 hour. After resting, dust the dough and your work surface generously with flour. 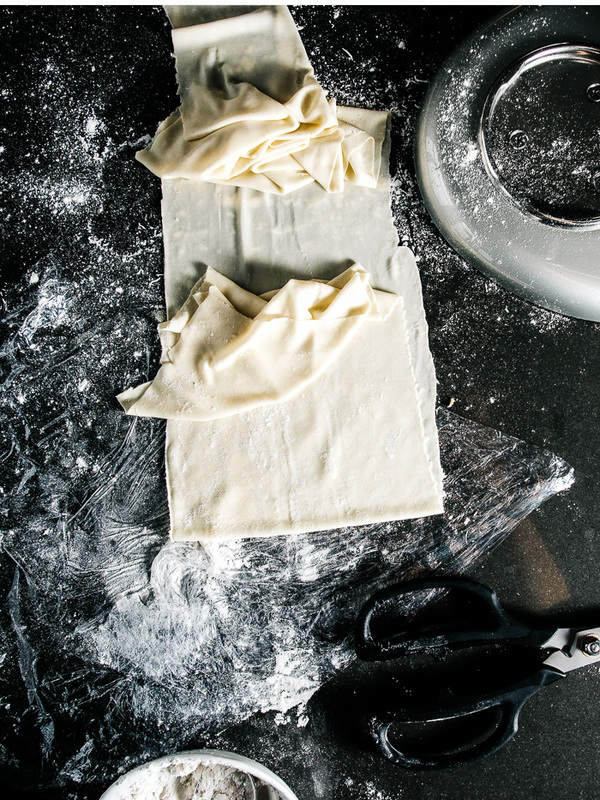 Use a rolling pin and roll out the dough into a rectangle. Prepare your pasta machine and pass the dough through on the thickest setting. Dust it again generously with flour, then feed it back to the machine, looping one end over the other and pressing down so you create a loop. Keep the dough generously dusted and keep rolling it until you’ve reached the thinnest setting. At this point the dough will be extremely thin and easy to rip. Carefully cut the loop and turn on the machine to roll the dough out. Spread the dough out on your work surface (which should be dusted with flour) and use your fingers to spread the butter thinly on the dough, much like you would when making cinnamon buns. Start to roll the dough up, as tightly as possible. If the centre of the dough starts getting thick and the ends start tapering, push the ends into the middle and continue to roll. 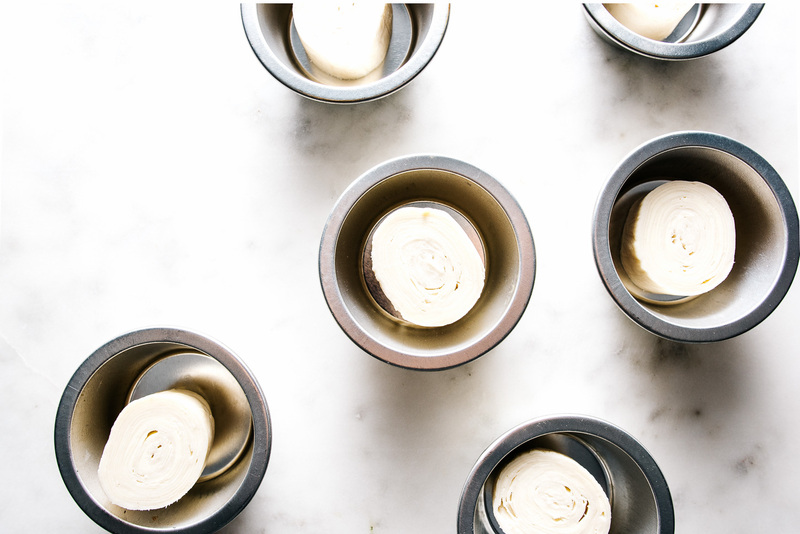 The goal is to end up with a thick dough tube, kind of the size of those rolls of cookie dough you find in the fridge section at the grocery store. Wrap up the dough tightly in plastic wrap and freeze for 1 hour until hard. Cut the log while it’s cold into 6 equal pieces, but shape it once it’s slightly softened (let sit at room temperature for 10 minutes) so it stretches without cracking. Place the disks into the tart molds. Dip your thumbs in water and push and smooth down the dough, starting from the center outwards, until the dough is tart-shaped. Try to aim for a thinner bottom with a thicker rim that goes above the tart mold. When the tarts are shaped, place them on a rack and freeze them for 30 minutes. Preheat the oven to 500°F. 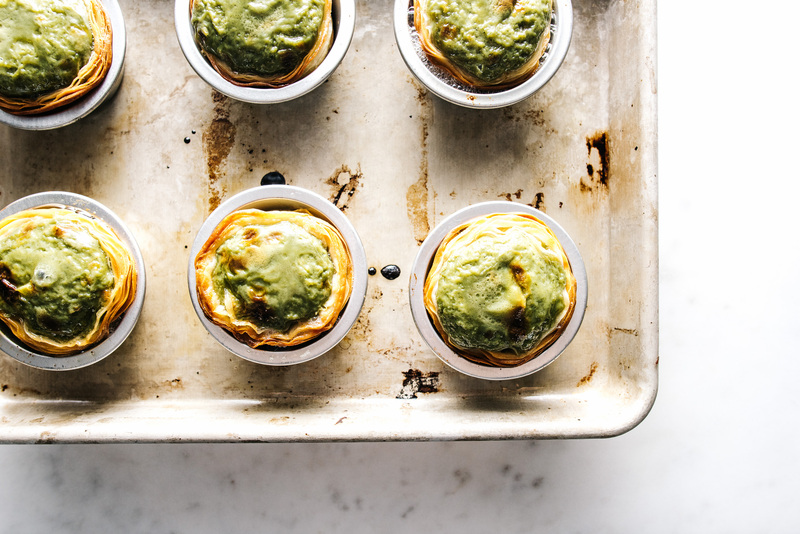 Pour the chilled matcha custard into the shells and then bake on the middle-rack for 10 minutes. Switch to the broiler, and keeping an eye on them, bake for another 5-7 min until golden browned and caramelized. Let cool on the sheet for 5 minutes, then transfer to a cooling-rack. Enjoy while warm, or at room temperature. 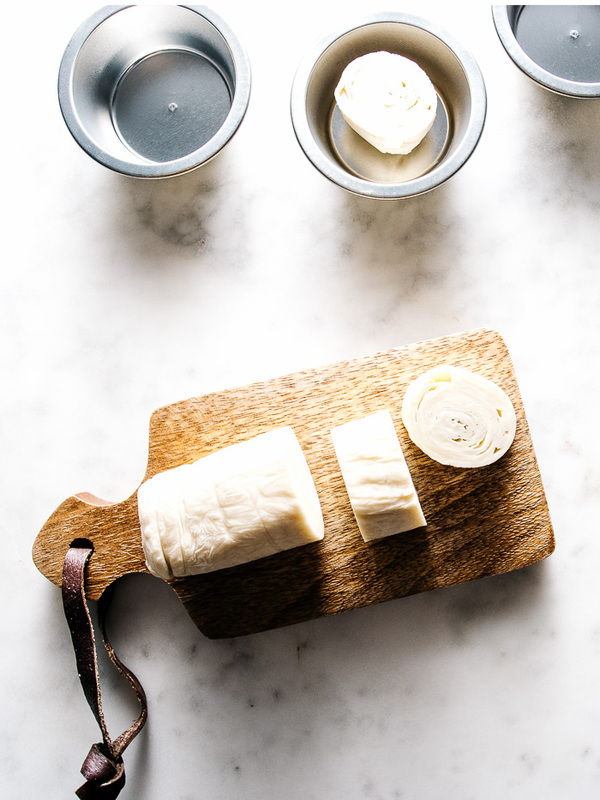 Notes: Make sure the butter is completely at room temperature. It’s Sunday! You know what that means: it’s time for Sunday Brunch. Why don’t you skip the line and make brunch at home this week? The coffee’s truly bottomless, the booze doesn’t have a crazy markup and you can chill out in your pajamas. Every Sunday I’ll post a brunch recipe. Soon you won’t be asking, where should we go for brunch – instead it’ll be, what should we make for brunch today? whoa! 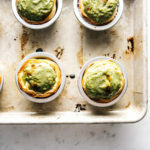 i’ve only ever had plain egg tarts before; the addition of matcha sounds SO GOOD tho! Simply perfect! Such a creative and delicious dessert! Also memorable on this special day! 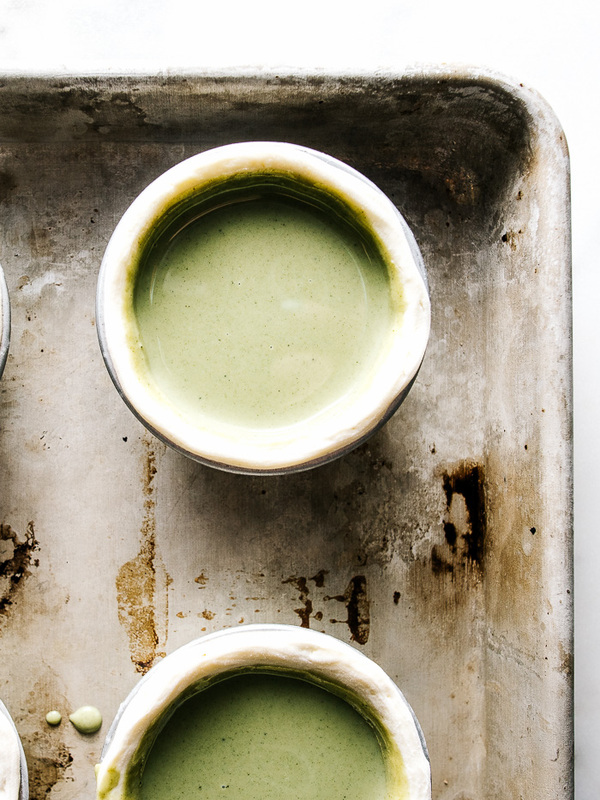 Mmmm, matcha sounds fabulous! May I ask where did you purchase your tart molds, and what are their usable interior dimensions? Thanks! I really like that the molds have a flat lip instead of a rounded one. i purchased them in japan – i haven’t seen any small ones with the flat lip. they’re about 2.88 inches. i know they sell similar ones on amazon but not with a flat lip. sorry i can’t be more helpful!